Last Sunday many families "officially" ended their Christmas celebration with a large, neighbourhood bonfire. This bonfire was in Arendal. Energien slippes rett ut i lufta i Bergen? It's a spectacular way of deposing the trees. Plenty of fire, but not much snow. I like the detail in the fire and the child's clothes. Back yard burning is not allowed here when the conditions are high risk for bushfire, which seems to be most of the time now but I remember the smell of burning the christmas trees from childhood. I like the idea of celebrating the end of the season with a bonfire. I, too, like the idea of celebrating the end of the holiday season with a bonfire!! Looks so warm and I could use a little warmth here in Portland today!! Hope your week is going well, Rune!! Enjoy! Our local township chops them up for mulch and gives the much away. It makes for a nice photo. Happy New Year, RuneE! I love the rainbow photo, it looks so full of light and colour and happiness. What a fun way to end the Christmas celebrations! I miss seeing all the trees lit up in people's windows while walking by. I agree with EG ; I'm always sad to see how trees end in cities, I prefer your way, which has more kind of majesty . 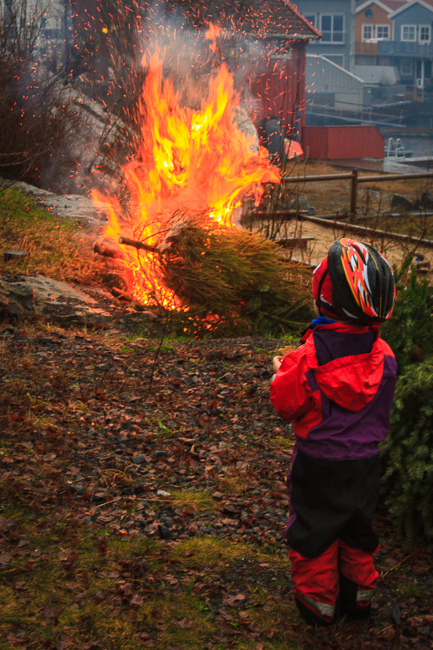 Burning the christmas trees on twelfth night (Jan 6, the eve of Epiphany) is a long tradition in some places. Our church did that for a long time but finally gave it up because so many people now use artificial trees. The city of Tulsa does a community bonfire that is pretty spectcular. That is a nice community tradition! Burning is not allowed here, so live trees are ground into mulch. We now use artificial trees, so ours goes back in the box until next Christmas. Great way to end the season. Would love it here, but we aren't allowed outdoor fires anymore. This is a cool tradition. We simply put ours out on the curb. No burning allowed here. I love to read of others' traditions. The photograph is splendid...as always! The little child must be sad to see such a great celebration end for a year. But this must bring closure to the season. a great way to provide a bit of warmth and dispose of the trees at the same time. Its a rather poetic method of disposing of the trees that brought glamour to the festivities. It is against the law, or illegal, to burn anything out of doors. It must be collected by the garbage truck or the trash truck and they dispose of things like old Christmas trees by taking them with a load of trash to a landfill. The red and orange really jump out at me, Rune. And the boy's red-orange, especially his helmet, connect him to the fire, which is ironically not so obviously destructive, but a kind of light and life against the gloom of everything else. Very nice. Don't know how I missed the post a couple weeks ago. Oh, I think the idea of a post-Christmas bonfire is much more fun than leaving the trees at the side of the road for the bin men to pick up.